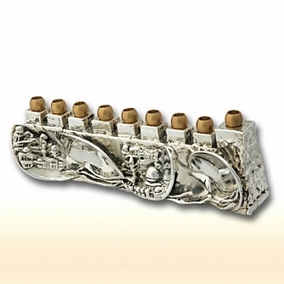 Jerusalem Hanukiya A Magnificent Judaica artisan sterling silver parcel gilt Hanukkah Lamp (Menorah). The front of this superb Hanukkah Lamp is ornamented with a relief depicting the view of Jerusalem. Its back is ornamented with a unique artisan stalactite-like pattern. The nozzles are made of 24k gold plated brass which adds to the overall sparkle. This Hanukkah Lamp was made in the electroforming method. Measurements: Height: 3.6in. / 9.14cm. Width: 10in. / 25.4cm. Thickness: 2in. / 5.08cm. Weight: 707gr. / 22.73oz. Marks: 925 for sterling silver, maker´s mark.